Today was the last day of my AP language class. I have already written to my teacher multiple times thanking her for how she has changed my life this year. I feel like I have spoken nearly everyday to my loved ones about how much I love this class and how important it has been to my development this year. But I really wanted to write a post specifically about the impact the class itself has had on me. After reflecting on all that I have learned about education in Arizona, I realize that the way this state treats its public schools is, to put it lightly, abominable. We had perhaps one of the worst legislative sessions in Arizona history for education, with the voucher program reaching a whole new level of expansion and our legislators going so far as to say teachers get second jobs to “enjoy the finer things in life, like boats.” Yes, that is a direct quote. The people that make bad decisions about what happens with education don’t think that education serves any purpose except to raise test scores. They don’t take into account the importance of adequate teacher pay and retention and smaller class sizes. But without getting too technical on the issues themselves, these legislators lack basic insight as to what one teacher and one classroom can do for a student. They fail to think beyond the money and almost never focus on the child, the person who should be at the center of these decisions. I wanted to give you, the person who votes for your legislators, insight as to what having an education has meant to me this year, and why you should make an active effort to vote for people who work to improve public education and not fight against it. This was one of the hardest school years of my life. On top of the general junior year stress about grades and the future, the 2016 presidential election happened, and sent me into a deep depression that stole months of my life. I go to a school where the majority of people are privileged and bigoted. That may seem like a generalization, but in my experience it has been true. Some of my closest friends have gotten bullied mercilessly for being gay. My friend couldn’t walk the halls holding hands with her girlfriend without fear of sexual harassment or homophobic slurs. My black friend has been called the n word multiple times by white men. I got harassed for wearing a Planned Parenthood shirt one day, and when the guy asked me why Donald Trump was a threat to women and I cited his multiple sexual assault allegations, he responded with “all men do that.” The election further intensified the hatred already running rampant at my school, and for the first time in my life I was being directly affected by it. All of this, on top of waking up every morning with crushing anxiety that World War Three would start and no longer feeling as accepted by many of those closest to me, pushed me into a dark hole. I didn’t even want to get out of bed most mornings. There were so many school days where my English class was the only reason I even showed up. There, it was okay for me to express my liberal opinions without fear of being attacked or the stress of having to be the political correction police. My voice was amplified, not repressed. We sat in a circle on camping chairs instead of desks. We critically analyzed literature and thought of each story in the broader meaning of the world. Every book we read related to prejudice, racism, classism, sexism—-really any branch of social justice. We spent so much time examining current events and politics. We had lengthy discussions about the dire state of public education in Arizona, about low teacher pay and the attempt to privatize public schools by the AZ government, effectively a war on the poor and the non-white. My teacher also brought local politicians in to speak to the students from both sides of the political aisle. It was in this class that I got to speak directly to Paul Penzone, Joe Arpaio, Mary Hamway, Kelli Butler, Eric Meyer, Kate Brophy-McGee,and more about issues like education, private prisons, immigration and health care. My most valuable experiences came from speaking to the politicians I disagreed with, because it taught me how to listen to the other side, to either find common ground with them or ways to argue against them. I realized that politics is not necessarily corrupt and inaccessible, and that those in our local government have more of an impact on us than the president of the United States does. I was politically aware before, but because of AP Lang I became politically involved, going to protests and legislative meetings and and getting involved in grassroots work and helping my teacher campaign for the senate in 2018. I owe this class my life. It gave me hope and community when I had neither of those things. It started me on a future path in education and politics that I never dreamed of taking. I will always be able to cite it as key to my future successes, as a bright spot in an otherwise dreary and depressing year. That is what one class can do for a child. 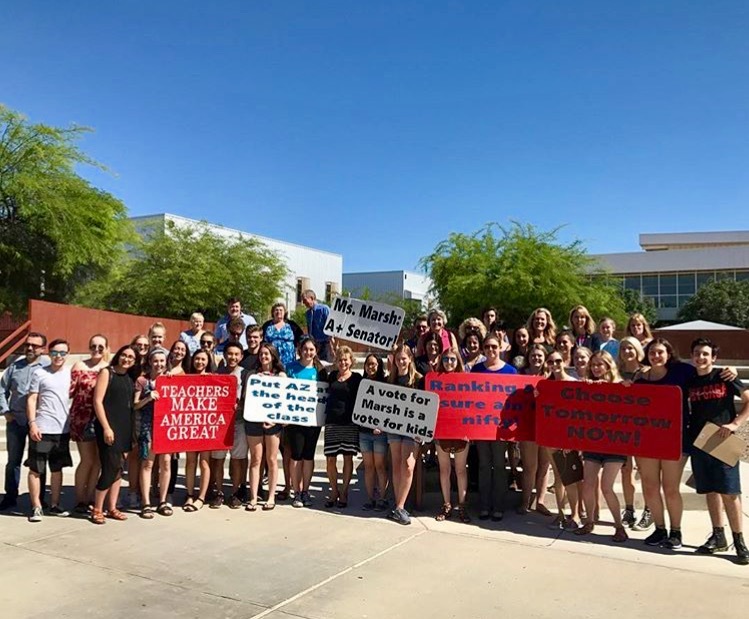 My experience with AP Lang is the reason why we all need to work to improve public education within Arizona, to elect leaders that believe in the welfare of kids and teachers alike, regardless of race or income. I wanted to share my reflection with you all because I believe that every child everywhere deserves to have my AP Lang experiences. Do what you can to help that happen. This is a picture of Christine Marsh’s first rally to announce her Senate campaign. She is the incredible teacher that I talk about in this post, and will be running against Kate Brophy-McGee in LD28 in 2018. This is her Facebook page so you can follow her on the campaign trail.